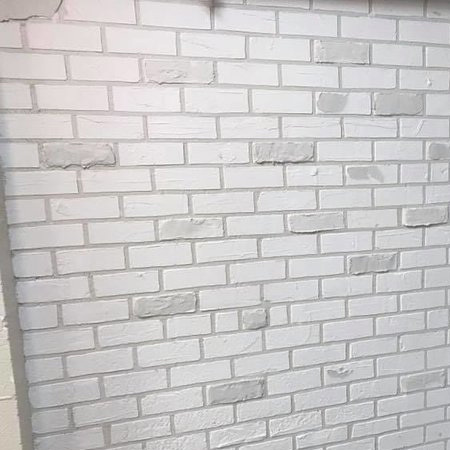 If you have a room that needs ‘a little something’ to make it pop, why not add a faux brick wall. 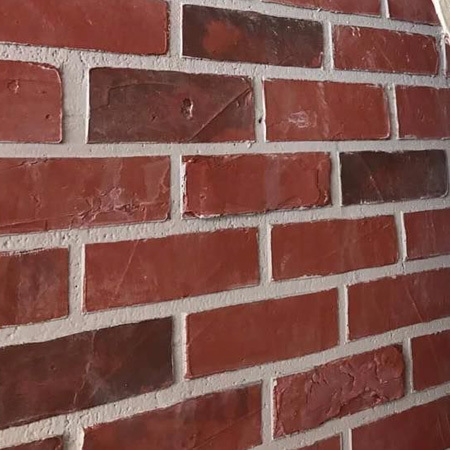 Here’s an easy way to add a faux brick wall to any room in a home. 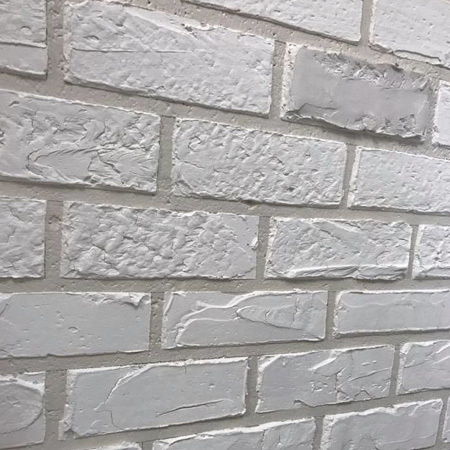 This faux brick wall is done by using finishing plaster and paint and is done in 7 easy steps. 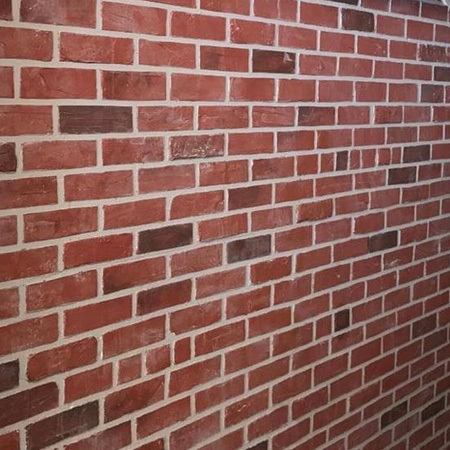 Buy all the materials and supplies for this faux brick wall project at your nearest Builders Warehouse. 1. 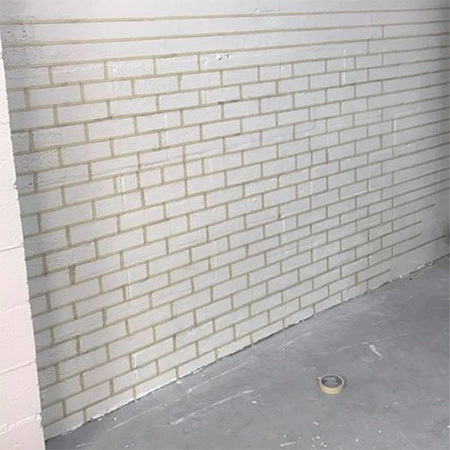 Using the facebrick as a template, measure this and transfer the dimensions onto the wall. Use a spirit level and pencil to mark the wall where the faux bricks will be applied. Mask along the drawn lines with masking tape. The masked off area will not be plastered and the tape will be removed to create grout lines. Take your time with drawing out and masking the wall – you want it to look good once you’re finished. 2. 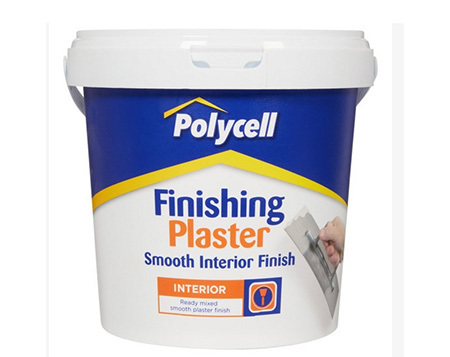 Now you can start applying the finishing plaster to the masked off wall. 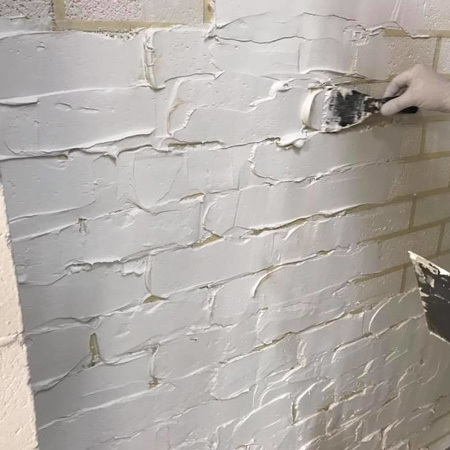 Apply a thick layer of plaster, about 8 to 10mm thick. 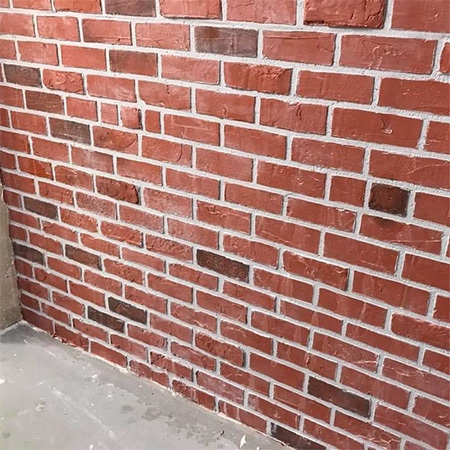 You want the finished faux bricks to stand out on the flat wall. Try to avoid getting too much plaster on the tape, as this needs to be peeled off later on. GOOD TO KNOW: Only work in a small section at a time – about 1/2 a metre. You have to remove the masking tape where you have applied plaster BEFORE the plaster starts to harden. If you don’t you won’t be able to remove the tape later on. 3. Let the plaster harden overnight and then tape off a few random bricks to build them up a bit. This will help to create a more realistic effect on the finished wall. Allow this to dry overnight. BELOW: A random selection of bricks with extra plaster layer for detail. BELOW: Close up of detailing on faux bricks. 4. 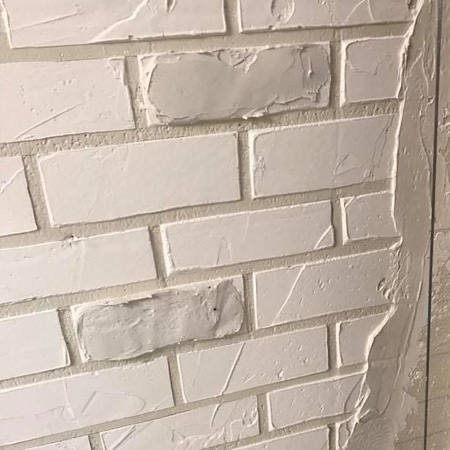 If you need to plaster a column or piece of wall that butts out, try to make it look as close as possible to how it would look if it was built with bricks. 5. When painting the plastered wall, first apply a terra cotta hued paint colour. You can apply this coat with a foam roller. You can adjust the colour for detailing by adding white and black to the terra cotta paint colour. 6. 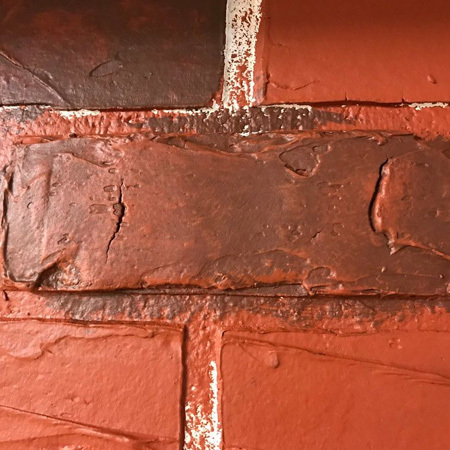 Build up coloured detailing on bricks using a foam applicator or paintbrush and some rags to blend the colours together. 7. 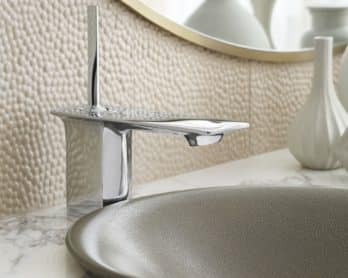 Use an artist’s paintbrush to paint the grout lines in a light grey colour. 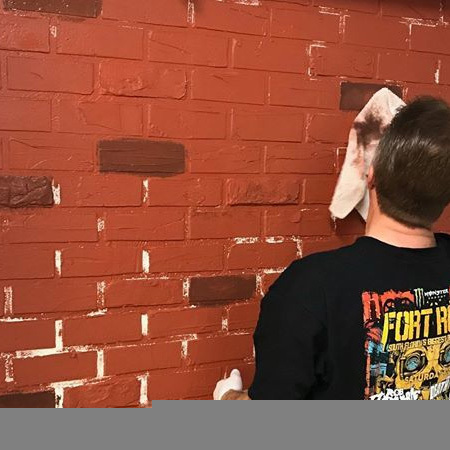 BELOW: Add black to give a dark hue to some of the bricks, and a dash of white for the lightened effect. 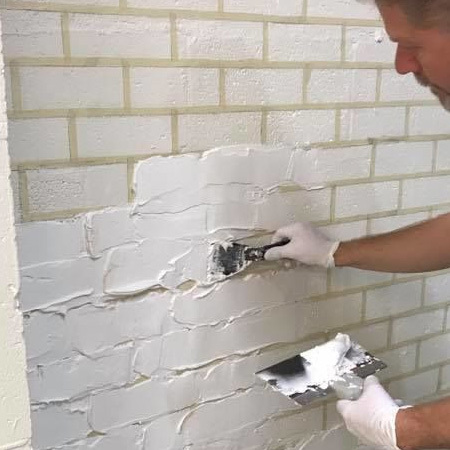 Use a wet rag to dab white and light grey paint onto random bricks and then a dry rag to dab off. 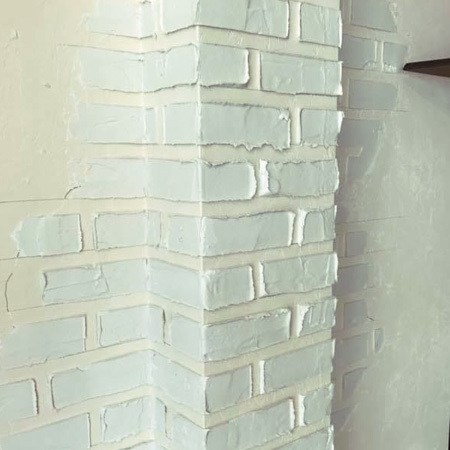 And that’s it… you have a faux brick wall to add interest to a boring room. DIY Instructions brought to you by Home-Dzine.